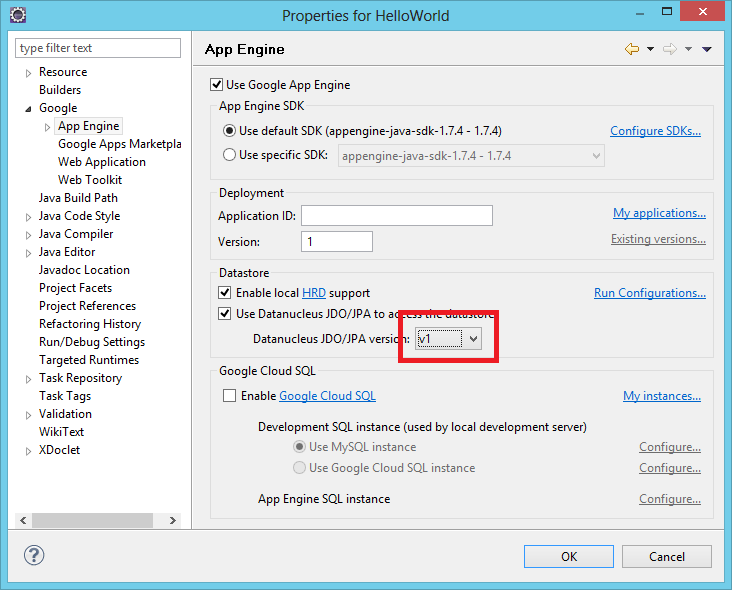 In this short tutorial I will outline the project setup and deployment steps needed to get a Jersey REST-application up and running at Google AppEngine. There are a couple of non-intuitive issues that got me struggling for days - hopefully you won't have to do the same. Give your project a name and a namespace and unselect "Use Google Web Toolkit", as we won't have any UI in our application. Also uncheck "Generate project sample code". 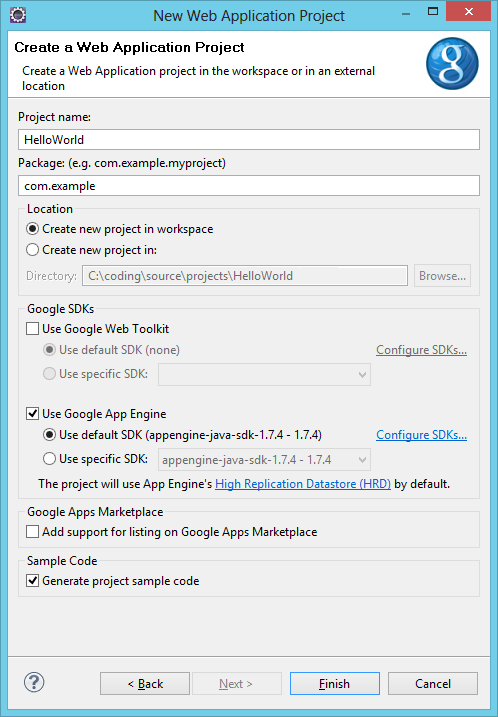 Now go to Project Properties (Alt+Enter while focusing on the project root in the Project Explorer) and go to Google > App Engine. Select v1 of Datanucleus JDO/JPA version. This is because using v2 will generate a dependency conflict on the file version of asm*.jar which Jersey also depends on. Note that the links from the Jersey.java.net-page always links to the newest version of Jersey. I can only guarantee that this tutorial works with the exact specified versions of the jar's. Remove asm-4.0.jar from the lib-folder. Note that you have asm-3.3.1.jar there instead. The POJOMappingFeature-param is the one enabling support for returning standard Java objects directly from an API method which then gets serialized to JSON behind the scenes using Jackson. See the Jackson documentation on how to tweak the output generated here. The DisableWADL-parameter disables use of reflection, which is banned at Google App Engine. I'm leaving the SystemServiceServlet as it is. You might not need this though. The deployment part couldn't be easier. 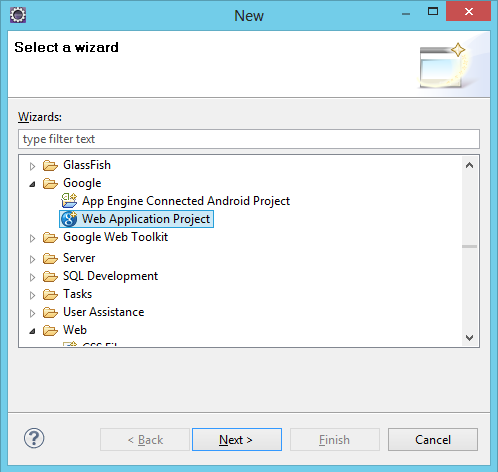 Right click on the project root in the Project Explorer, click Google > Deploy to App Engine. If you haven't already, you'll be guided into the App Engine project settings in order to set your Application ID. When that is done and if everything goes well, you should have the service available in about 30 seconds. From this point on, the fun part starts. If you're new to Jersey I a good starting point is to read . A good starting point is the REST with Java (JAX-RS) using Jersey Tutorial by Lars Vogel. That post contains a lot of setup information that is irrelevant for Google AppEngine though, but chapter 2.2 JAX-RS annotations, and the example in chapter 7.3 Rest Service are still very relevant. Hello, thanks for the comment, this is the first tutorial that worked for me (GAE 1.8.0 with Jersey 1.17). I only have one question: can i use the JPA somehow? As I wrote in the blog you can use JPA v1.0, but not v2.0. I'm trying to make it work with GAE 1.8.0, Jersey 1.17 and jDK 1.7. GAE documentation states that SDK 1.8.0 supports java 7 and that java 6 will be remove in the future. Is it possible to make it work with Java 7? Felipe: I don't know. I guess one just have to try. I don't have time to test it right now, but I'd be very interesting to hear if you get it working! I am a newbie. This was a very helpful tutorial for me to understand. I tried almost 3-4 tutorials but all of them didn't work because of some differences in versions.